Part Time Cooks might not be a household name, but the hip-hop duo are making their mark on the Korean hip-hop scene with the release of their first studio album, “7:30,” and a tour of Japan to start this week. 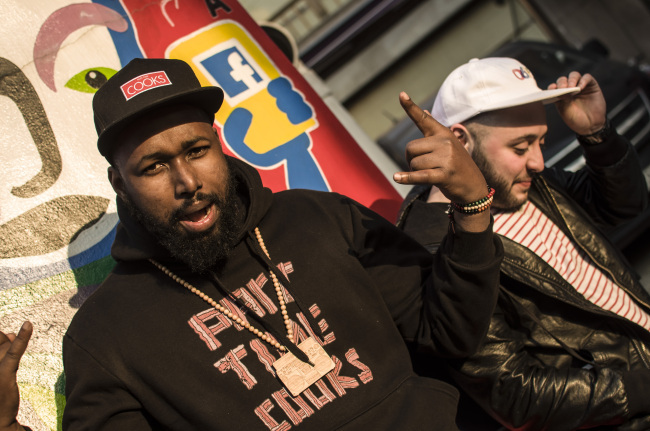 Hailing from North Carolina and Durban in South Africa, the 30-year-old rappers met through a mutual friend four years ago after moving to South Korea to teach English. “I decided to be his hype man and he decided to be mine until we started to make music together,” Moss told The Korea Herald. Previously, the duo came out with an EP called “Midnight Snack” and an album titled “Baker’s Dozen,” which consisted of 13 songs written and recorded in two years. The 12-track album took eight months to produce with New Zealand producer Shaun “SoulChef” Hopkins after they met over the Internet and was released in June. Moss said the meaning of the song “7:30” derives from a Big L song which references the time as being “crazy” in American slang. “He talks about 7:30 being crazy because of the bent hands of the clock -- we relate to that and that’s the theme of the album,” Moss said. The duo worked on Baker’s Dozen and 7:30 simultaneously, allowing PTC to become more comfortable with recording music and finding their rhythm. “The first part of Baker’s Dozen was still finding our sound and ourselves and 7:30 was much more comfortable to make because we were in our rhythm constantly,” Moss said. They soon developed an effective method of finding and listening to beats, then adding lyrics, concepts and themes. “Our sound has a 90’s hip-hop vibe with soulful samples and boom bap type drums,” Moss said. PTC find their inspiration in all facets of life, whether it be through relationships, introspections or life in Korea and back home. Goode and Moss discovered their passion for music in their youth, but did not consider a music career in Korea until they formed PTC. The pair started off by traveling around the world and eventually settled in Korea to make a name for themselves. “I go wherever the music takes us. At the moment we are here making a name for ourselves but we are open to moving if it opens us up to a wider audience,” Moss said. According to Moss, the best part of PTC is his friendship with Goode. “We are both doing what we love and we have become closer and really good friends over the past two years and in a place like Korea where everyone is coming and going it’s hard to have a friend like that,” Moss said. But the duo’s musical journey has had its fair share of bumps along the road. In the last two years, three members of PTC’s team left -- their cameraman and photographer, visual director and lead singer. “We had to narrow it down and make it work with just two of us. It was difficult because instead of having five people behind promotion, we only had a team of two,” Moss said. But the pair will “keep cooking.” “We believe that whatever your talent is, you have to use it -- don’t let it go to waste -- we try to portray that in our music,” Moss said. Part Time Cooks will tour Japan from Friday with performances in Osaka, Hiroshima and Tokyo. “We are looking to go the States next year -- we are ready to grow internationally,” Moss said.